Whether you have a green thumb or are looking to learn more about gardening, you’ll want to check out Hick’s Nursery Flower & Garden Show. Show goers can view beautiful displays, free seminars and children’s activities! Free parking and admission. Rejoice in the arrival of spring with three days of exhibitions, theater performances, film, music, garden tours and workshops. Participating organizations include: Bay Street Theatre, Southampton History Museum, Parrish Art Museum, Guild Hall and many more. Get ready to fish for brown, brook and rainbow trout on top of the lake’s large yellow perch population. There will also be fishing instructions, fly casting demonstrations and a fish cleaning station. (Note: The freshwater fishing license requirement will be lifted temporarily). Join in a celebration of warm weather with music from Walkie bear and WALK radio. In attendance will also be Rocking Horse Ranch Petting Zoo, a student art show, Roseland School of Dance performance, balloon artist and much more. Partake in a festival that brings attention to the importance of trees and the need to preserve the environment. Activities include face painting, a petting zoo, live music and caricaturists. Bring your leashed dog for an invigorating walk and healthy exercise in designated garden areas. Meet fellow dog lovers in a beautiful environment. You’ll also have the chance to visit with rescue groups and vendors selling items for your furry friends. 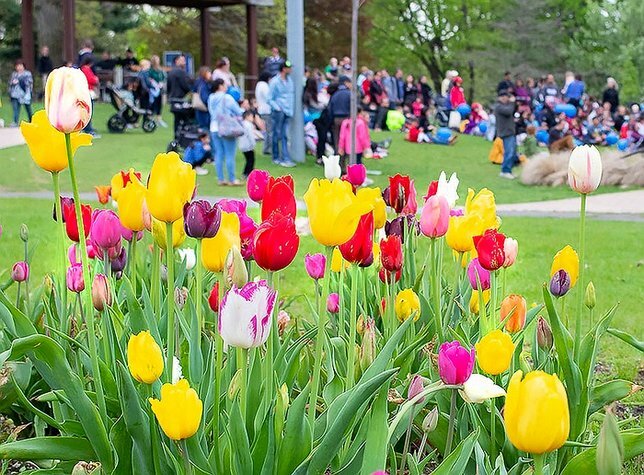 Don’t miss more than 20,000 tulips, art exhibitions, activity booths, musical performances and refreshments. Visitors can also enter to win around $300 through the annual tulip festival photo contest. Enjoy spring with the blooming of sakura (cherry blossoms), the sounds of taiko drums and a variety of Japanese cultural exhibits. There will be activities like ikebana flower arrangements, tea workshops, manga drawing, origami paper folding and kimono dress-ups. For four days, more than 100 independent artists of all genres will serenade crowds around various venues in Montauk. And that includes the popular Gurney’s Montauk and Gosman’s Dock. Spend Memorial Day Weekend watching the US Navy Blue Angels paint the sky white. Pro Tip: Get there early since past shows have attracted more than 200,000 people. Subject: LongIsland.com - Your Name sent you Article details of "These Long Island Spring Festivals Can’t Be Missed"